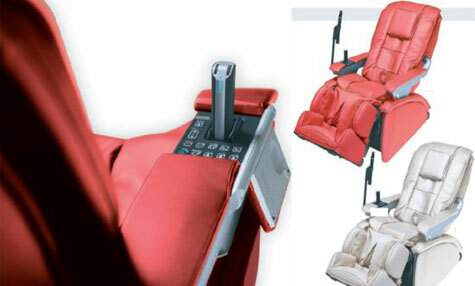 The Inada D.6 ROBOSTIC massage chair is the most advanced massage chair in the world. Completely tailor a massage to your liking and your needs with 10 different Healthcare programs or a totally manually control. Create and memorise your favorite massage routines and adapt the massage chair to your every changing need! 3D Roller Mechanism From the originators of the human touch massage mechanism now comes the “3D Roller Mechanism.” The 3D Roller Mechanism from Inada is the only massage mechanism in the world that has the ability to push the rollers out for a deeper massage or withdraw the rollers for a more gentle massage. Rollers rotate just like real human wrists and mimic the fine movements of a massage professional. D.6 ROBOSTIC massage chair delivers a full 6cm of forward and backward travel. Optical Shiatsu Point Sensor Shiatsu points, which differ between people, are automatically detected by the Inada massage chair optical sensors. Before you start a massage program, position the massage chair for comfort, then relax. When you choose your program, D.6 ROBOSTIC massage chair will begin with a scan of your back that will compare your profile to 100 stored profiles. D.6 ROBOSTIC massage chair will than match your profile to the nearest stored profile and provide you with a totally customised massage. Joystick Manual Control System ROBOSTIC instantly responds to your input. Control every aspect of your massage with ROBOSTIC’s intuitive joystick control. Plus, ROBOSTIC is capable of memorising five minutes of any customised massage which it will repeat with the touch of a button! It’s the perfect massage chair for you changing relaxation and back therapy needs. Aches, pain and stress are becoming commonplace in this modern world. How about a nice full-body shiatsu massage? Sounds like a good idea, doesn’t it? However, for most of us, our busy lives and long working hours make this an expensive and time consuming luxury. But with INADA MASSAGE CHAIRS in your home it becomes easy and affordable. For complete and total relaxation INADA MASSAGE CHAIRS are the answer. Our massage chairs remove your fatigue and give you renewed energy at the simple push of a button. The massage chair born in Japan is about to make the next era. The multifunctional FAMILY SOGNO is designed as a piece of furniture with round soft lines, compact size and luxury colours.